How many Twitter users in Sweden 2012? In February 2011 Intellecta Corporate published the results of their first Twitter Census. Hampus Brynolf and Intellecta have today presented the results of their second Twitter Census. There are almost 300,000 Swedish Twitter accounts. The same method as the first Twitter census has been used to decide if a Twitter account is Swedish or not. Details of the method can be found in last year’s blog post. Using the same method means that we can directly compare the figures from last year with those from this. In December 2010 there were 91316 Swedish Twitter accounts as reported in the first Twitter census. 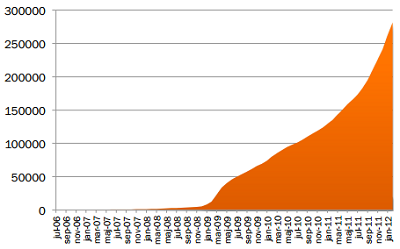 As of April 2011 there were 299000. Basically three times as many in just over a year. In December 2011 Aitellu presented the results of their Twitter research. Which they have recently updated. Their method for counting Swedish accounts differs to that of Intellecta’s, so the two figures are not directly comparable. That said, in January 2011 Aitellu counted 146995 Swedish Twitter accounts. In May 2012 they announced that the figure had risen to 318651.That’s roughly double as many in half a year. Both sets of research clearly show that Twitter is growing faster than ever. What Hampus also revealed today was how the reach of Twitter had broadened dramatically. In the original Twitter census, the word “journalist” was the most common word in bio texts on profiles. Now words such as “student” and “musik” have taken the lead as most frequently used. Just as last time, the survey calculated the number of active Swedish Twitter accounts. Last time round, just under 36000 accounts had Tweeted at least three times, had at least one Swedish follower or followed at least one Swede, and Tweeted at least once in the 30 days up to when the analysis of the account was performed. The comparable figure in this year’s census is 171000. An increase of 475% in about 15 months. Last year, the “Twitter elite” as Hampus jokingly named them, were 11215. These were people who, on average, tweeted at least once a day during December 2010. The number of very active accounts has risen in in line with the overall number of active accounts In April 2012 the figure stands at 52887. It’s still the case that a relatively small number of Twitter users account for the vast majority of tweets. 7% of users have generated 75% of tweets. Although the Swedish user base has moved beyond the technology interested and those working within media, Twitter is still not commonplace and is dwarfed in size by Facebook (which in many age groups has a 100% reach in Sweden), and probably beaten by a number of other forums and networks such as Flashback, Linkedin and perhaps even Instagram. Size isn’t everything and although the survey has shown that the vast majority of accounts show little sign of activity, there is an increasingly diversified set of clusters and communities containing active users. In some of these clusters, Twitter is an important platform for communication.